This chapter mainly covers on steps to deliverance and healing on matters that are found to originate from any of the four doorways Satan gains legal grounds: ignorance, deception, sin and storms of life. The deception on spiritual warfare and deliverance is used as an example in steps to deliverance and healing. In addition, a key distinction is made between deliverance and healing. Please note that deliverance is one thing while healing is another matter altogether. They are not the same. Each has its unique areas. Once one understands the distinction he/she is able to experience the healing process with much peace, faith and patience. An understanding of the difference between deliverance and healing will facilitate the growth of the fruit of the Holy Spirit. “The fruit of the Spirit is love, joy, peace, patience, kindness, goodness, faithfulness, gentleness and self-control. Against such things there is no law. Those who belong to Christ Jesus have crucified the sinful nature with its passions and desires. Since we live by the Spirit, let us keep in step with the Spirit,” Galatians 5: 22-25. It will also overcome matters that grow in the absence of the fruits of the Holy Spirit. These include doubt, fear, hurry for instant results, excessive demand for deliverance to come from other “super-spiritual” people instead of coming from within or from those burdened to intercede for an individual, and so on. God’s deliverance ends any further interference of Satan that came through the practice of the false spiritual warfare or whatever area that one was previously in ignorance, deception, sin or under storms of life. Healing, on the other hand, enables us to recover from all the harm caused by the assumed spiritual warfare or whatever gave Satan access. The harm may have been spiritual, social, physical, material and so on. We seek God to bring healing in all the areas that have been wounded through ignorance, deception, sin or storms of life as we begin to begin to walk according to his biblical ways. Healing may be instant or may be an ongoing process determined by the Healer, the Lord. Deliverance, on the other hand, is instant once one repents and ceases practices that are contrary to God’s will. The legal grounds of Satan that he used to interfere with one’s life are broken once old ways that brought legal grounds end and the biblical ways begin to be applied. For instance, ending the practice of the erroneous spiritual warfare and applying true biblical spiritual warfare and deliverance principles closes all the doorways that brought problems through the erroneous spiritual warfare. To illustrate the distinction between deliverance and healing suppose I have a dog named Ignorant. A neighbor has one named Trouble. Trouble continues to harass Ignorant because he is able to enter our yard. Ignorant has a habit of digging holes by the hedge of the yard. These holes enable Trouble to enter the yard. Life is terrible for Ignorant after digging up these holes. He has constant wounds from Trouble that he keeps nursing. He is unable to lead a normal life because of Trouble’s constant entry and beatings. Then one day I decide to block the holes by the hedge around the yard in order to stop Trouble from entering. Since that day Ignorant has never had to worry about any further attack from Trouble. The hedge or covering around the yard is now properly sealed. Trouble is unable to enter. Ignorant is now delivered from Trouble’s attacks. Never will he have to worry about being attacked, unless he breaks the hedge in another area. Ignorant is now unhindered to enjoy and pursue his dreams around the yard. No more further beatings or fear of beatings anywhere around the yard. It is total deliverance from further beatings. However, Ignorant remains with one problem to overcome. He still has wounds that Trouble inflicted on him before holes to the hedge were sealed. He needs healing from all these wounds. He needs to ensure he eats healthy food, avoid things that may slow or hinder the healing process, etc. If the wounds need extra treatment he would need a vet to care for him. Deliverance was instant but healing will have to be a process. Before asking the Lord to “deliver us from evil (or from the evil one),” (Matthew 6:12-13) we’re required to repent to God for walking outside his will. Anything outside his will is sin regardless of whether it was willfully done or was out of ignorance. It was common in the Old Testament to confess all sins including those done through ignorance. Even sins of parents and ancestors were confessed. These were sins none of them had anything to do with. The people that arranged, out of ignorance, for Christ to be killed also needed to repent although Christ had already forgiven them. He said, “Father, forgive them for they do not know what they are doing,” (Luke 23:34). “These dreamers pollute their own bodies, reject authority and slander celestial beings. But even the archangel Michael, when he was disputing with the devil about the body of Moses, did not dare to bring a slanderous accusation against him, but said, “The Lord rebuke you!” Yet these men speak abusively against whatever they do not understand; and what things they do understand by instinct, like unreasoning animals--these are the very things that destroy them,” Jude 1:8-10. We confess to God the sin of slander against celestial beings, acknowledge that we walked in ignorance, repent of the sin and ask God to deliver us from all its consequences. We also thank him for revealing such truths to us and ask him to continue revealing all truth that will set us free from Satan’s influence. For an example of a prayer of repentance, deliverance and healing please see Appendix 2: Deliverance, Healing and Restoration Prayer. It may help those who may need to understand scriptural backing on repentance, deliverance and healing. It is not intended to be a substitute for one’s own devotions. Repentance also requires ceasing to associate with the sin. This includes throwing away any books, literature or multimedia that embrace non-biblical matters such as the erroneous spiritual warfare and deliverance. It was customary in the Old Testament to destroy all that was detestable in God’s sight. This did not change in the New Testament. Jesus violently cleansed the temple of traders who where using God’s house for wrong purposes. We are temples of God’s Spirit (1 Corinthians 3: 16-17). He has no comfort living with objects that do not please God. Christian converts in Ephesus who had practiced sorcery and divination were asked to destroy the materials they used. They destroyed them publicly. “A number who had practiced sorcery brought their scrolls together and burned them publicly. When they calculated the value of the scrolls, the total came to fifty thousand drachmas. In this way the word of the Lord spread widely and grew in power,” Acts 19:19-20. The unscriptural spiritual warfare and deliverance may not fall in the core definition of sorcery or divination. However it is still in this category since it deals with the spirit world outside scriptural order. The practice invokes or arouses evil spirits to answer to our demands in a way that scripture forbids. Our interaction with them in the spirit world only opens doors for them to interfere with our lives. This is not to say sincere believers who advocated this type of spiritual warfare willfully misled people into forbidden activities. The deception flood of the erroneous spiritual warfare and deliverance teachings got so high that many of us easily found scripture to back up our resolve for direct confrontation. Believers were zealous in their resolve to directly confront demonic spirits that scripture was easily taken out of context without even realizing it. Some are still zealous in such false teachings. Our ministry (Jesus Work Ministry) has an outreach to such believers. Part of our calling is in overcoming the false teachings by revealing biblical principles on spiritual warfare and deliverance ministry areas. Deception can be conquered just as it has throughout church history in various areas. (Please visit our websites: JesusWorkMinistry.com and SpiritualWarfareDeliverance.com (the two websites are interlinked through easy navigation)). Deliverance comes once we have embraced the truth about spiritual warfare or whatever area that we were previously in ignorance, deception, sin, or under storms of life (when responding to storms the wrong way). Our Lord said, “If you hold to my teaching, you are really my disciples. Then you will know the truth, and the truth will set you free,” John 8:31-32. Any area where truth is revealed therefore brings freedom. We’re to expect complete freedom from manipulations and attacks of the enemy. Deliverance ends all that came from our involvement in deceptive spiritual warfare and deliverance or whatever area that we were previously in ignorance, deception, sin or under storms of life. Deliverance is instant once the required biblical principles are applied. Deliverance ends any further attacks. The wounds may appear as if deliverance has not occurred but that’s if one does not understand what has taken place in the spirit realm. The enemy’s legal grounds of using the erroneous spiritual warfare and deliverance teachings to steal and destroy any areas of our lives and those we’re connected to are destroyed once we know and apply the truth. The Lord comes to our defense in this area where the enemy once used to bring defeat in our lives. It implies we will never receive another attack from hell using the door of false teachings on spiritual warfare and deliverance. Such a door or whatever door that we were previously vulnerable through ignorance, deception, sin or through storms of life is shut forever once the truth is embraced. The Lord delivers us not just from further attacks but also from the consequences of the ignorance, deception, sin or storms of life. Deliverance from the consequences is what is called healing. The attacks brought wounds in our lives in one way or another – spiritually, physically, socially, materially, and so on. The wounds are the consequences of the ignorance, deception, sin or storms of life. The Lord brings healing and restoration in our lives as we embrace his biblical ways and truths on the areas that we were previously in ignorance, deception, sin or under storms of life. The healing and restoration may come in different ways than we may expect. It’s not a return of the same matters that were lost, even though God may work it that way for some. It may be a double spiritual anointing to serve God. It may be a social healing in the family or church. It may be a career or financial breakthrough. It may be a physical healing from an illness. Or a combination of many factors. The life of apostle Paul can be an example, though his experiences are not related to falling to the spiritual warfare deception. He was nevertheless deceived by the enemy that what he was doing (persecuting Christians) was right in the eyes of God. When God opened his eyes the Lord used him to do multiple times more damage to Satan’s kingdom than what Satan had used him for. To this day we’re still being edified by his divine inspired epistles. The time of restoration will be different for each of us. In our era of modern technology which has increased the speed of getting things done it’s tempting to desire quick fixes. Our patience has been declining even in the body of Christ. God however, seems not to be “catching up” with our growing sense of urgency. He has a way of relating with us often outside our time frame. This can be difficult now and again if we’re not submissive enough to have him lead us the way he pleases as a responsible Father. It’ll therefore be helpful to understand that God is still working according to his schedule in case we don’t receive instant restoration. However, there’s nothing wrong with expecting instant answers. “Will not God bring about justice for his chosen ones, who cry out to him day and night? Will he keep putting them off? I tell you, he will see that they get justice, and quickly,” Luke 18:7-8. “Is not this the kind of fasting I have chosen: to loose the chains of injustice… share your food with the hungry…Then your light will break forth like the dawn, and your healing will quickly appear…Then you will call, and the Lord will answer; you will cry for help, and he will say: Here am I,” Isaiah 58:6-9. God will also give you the grace in doing your part to facilitate the healing process. The following are some examples of healing processes in different areas – spiritually, socially, materially and physically. If healing is in a spiritual area God will give you the grace in doing your part to facilitate the healing process. This includes healing of the wounded spirit. It also includes deliverance and healing of spiritual wounds that exposed one to the spirit realm. For example, one seeing and hearing demonic spirits will be able to stop fearing the appearance of these beings. Seeing, hearing or sensing demon spirits implies one previously tapped or got access into the spirit world through whatever wrong practices. Prayer combined with fasting also helps in the healing process. Until God completely closes your access into the spirit world your focus should be on him not the evil spirits being seen, heard, or sensed. In his time God will bring the required covering to your spiritual eyes and senses. You will then be like the majority of us who are covered from seeing and hearing these evil beings. For more information on spiritual healing areas please see Chapter 5 on deliverance and healing in spiritual areas. If healing is in the social area God will also give you the grace in doing your part to facilitate the healing process. For example, in a family area on conflicts he will give you the grace to pray and fast for matters or individuals bringing problems. If you’re the problem he’ll enable you to fix issues that cause problems. Do not expect a superhuman personality but a change in how you handle you weaknesses that cause problems. For more information on social healing areas please see Chapter 6 on deliverance and healing in social areas. In the area of finances God will enable you to cultivate a generous heart. He’ll also enable you to let go of expenses you can live without. These expenses not only hinder repaying of debts (if you have any) they also hinder you from giving, an avenue that God uses to release his material blessings. For more information on material healing areas please see Chapter 7 on deliverance and healing in material areas. If it’s in the area of physical health God will enable you to know and apply physical health principles that are in your sphere of responsibility. These are natural health principles. Where it’s in God’s sphere of responsibility or power he’ll bring healing supernaturally. 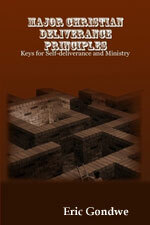 For more information on physical healing areas please see Chapter 8 on deliverance and healing in physical areas. Blind faith is not a spiritual weapon against ignorance, deception, sin or storms of life. Only the truth is and applying it. If blind faith was a weapon against ignorance or deception all Christians would have almost no problems. All we would need is to believe God that somehow he would drop the answers to our various obstacles. I wish this was the case. But it’s not. For instance, many believers are trusting God to bless them materially and to miraculously overcome their financial obstacles. But few aggressively apply God’s biblical principles to financial freedom. Having faith in God does not enable him to make short-cuts to his laws of seed-time and harvest-time. Having faith in him and obeying his ways is what pleases him. It is fulfilling all our required areas of responsibility that pleases him. Faith is actually inevitable when applying God’s principles to financial freedom. The less resources one has to sacrifice the more he/she would need to believe that whatever she gives up will bring a reward in future. A believer who is not sure making needed sacrifices would later solve financial problems would be less willing to make sacrifices. Such a believer assumes making sacrifices is as good as playing the lottery, gambling her scarce resources and counting on some strange statistical luck. Few would want to make sacrifices of scarce resources on matters that have little or no guarantee of having any reward. So a believer who obeys God’s word in applying his biblical principles to financial freedom has faith in God to fulfill what he’s promised in his word. Faith leads to application of God’s principles. It should not lead to mere belief in God to solving whatever obstacles. Such is blind faith. There are many sincere believers that through blind faith are facing avoidable afflictions. “My people are destroyed from lack of knowledge,” Hosea 4.6. God’s people, not those whose father is the devil (John 8:44) are destroyed from lack of knowledge. God’s people are destroyed not because Satan is strong and furious. It is because they lack knowledge in areas Satan has gained access. Neither are they destroyed because they have no faith in God. It is because they are missing the knowledge that needs to be combined with the faith. May this never be the case over any one of us who are have settled not to live by blind faith. Please see what real faith is, covered in the chapter: True Biblical Spiritual Warfare = Indirect Confrontation. True faith is discussed among the weapons of spiritual warfare. It is a shield.